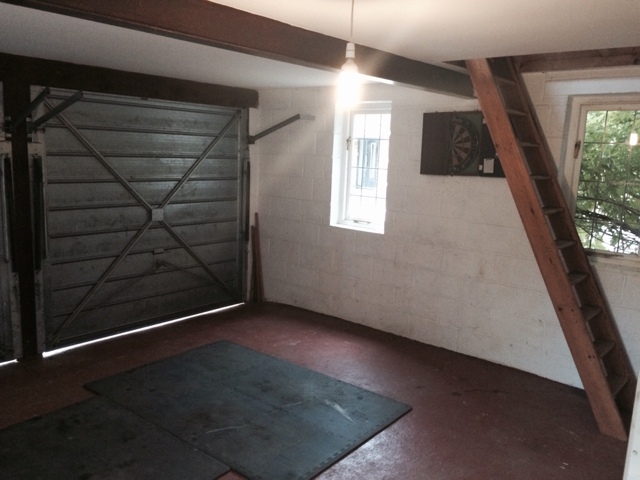 Hi all, just about to buy a house, needs a bit of work, but most interested in putting an office over the garage, and checking if I need to consider anything extra! How much regs will affect it etc. Essentially its a double detached garage. It's brick outside and blocks inside,and there is a steel joist across the width supporting the wooden joists forming the floor above. 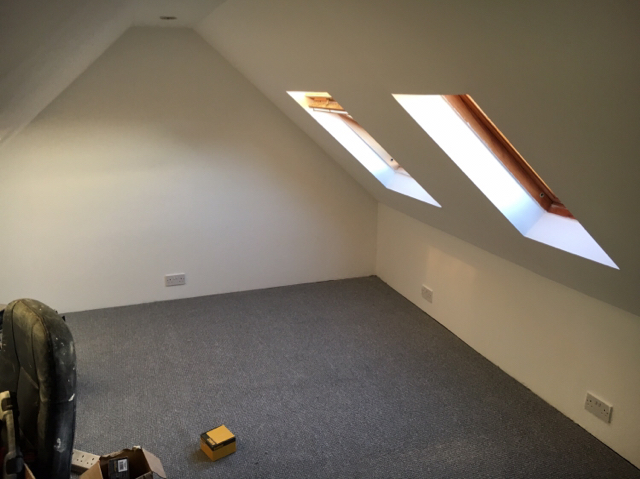 The loft area is already boarded (so would want to pull up and insulate), but other than that it's just the rafters with no props or ties. 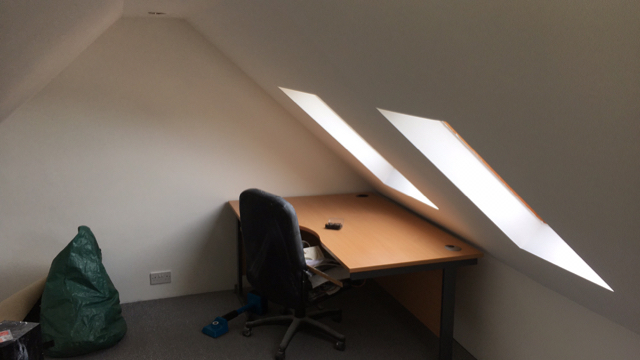 There is also a relatively small velux window there, and some steepish stairs (that effectively take out of of the parking bays). So guessing I need to insulate as a starter, and get some decent lighting in. 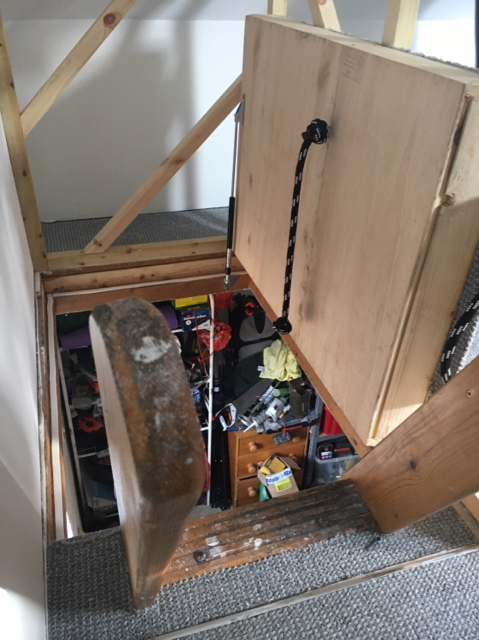 Would I be best putting in a partition type wall with door at the top of the stairs, or is there another elegant solution (some sort of hatch? ), mainly to help with warmth! Talking of which is it worth trying to insulate the actual garage area at all (reducing drafts round the doors and some insulation on the back). Also how much would building regs come into it?! Many thanks for your time and thoughts. 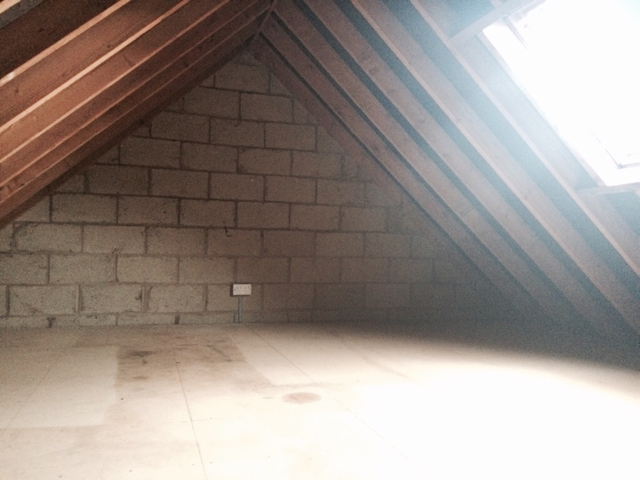 Strictly speaking Building Regs are required when you make an area like this habitable. Of course you can do what you want to the space and it will only become an issue when you come to sell, especially if you advertise as a home office area. 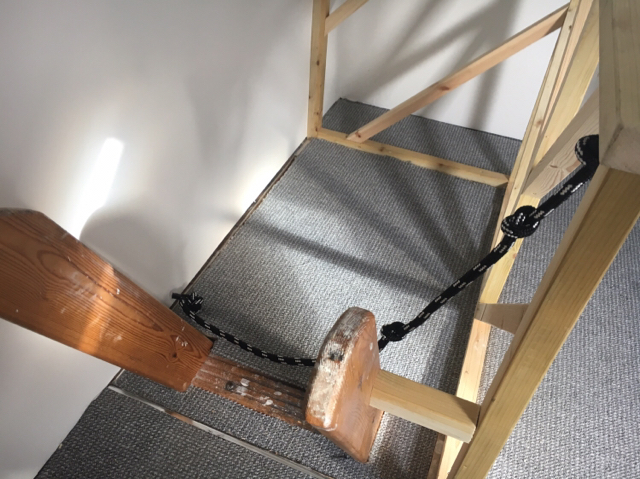 In this instance there will be a requirement for insulation, fire escapes and the loft type access might not conform so you might be opening a can of worms to go down the official route. 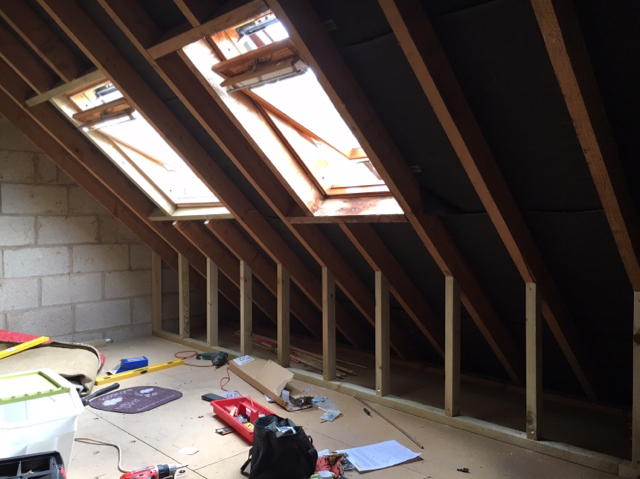 If you do it properly then it might be worth putting a dormer in to extend standing area and let more natural light in but this is heading into a costly project rather than giving some usable extra space. If you are not looking for added value to the property then you might want to so your own thing. Thanks, will probably do my own thing and maybe review down the line and see how much (££) needs to be done. 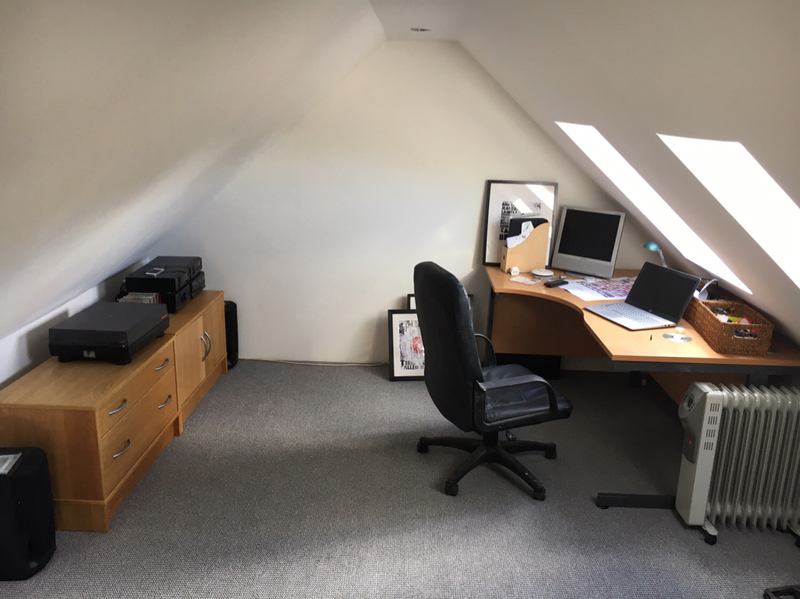 So I now have the house, and think I will be doing 'my own thing', and putting in an office. whilst I'm not sure I can fully build to regs, I want it reasonably close ( and warm!). 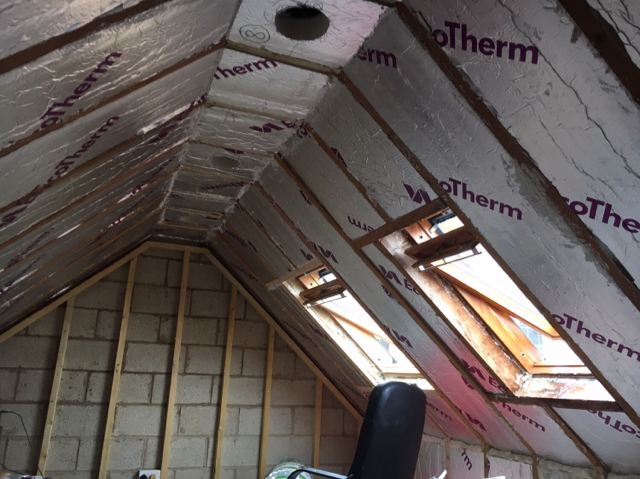 So looking a bit more closely, the rafters and joists are all 130mm depth, and understand i need 50mm ventilation on the roof tile side, so 70mm insulation between the rafters, and 'some' insulation under the plasterboard (thinking building to regs might cut the useable size of the room too much). 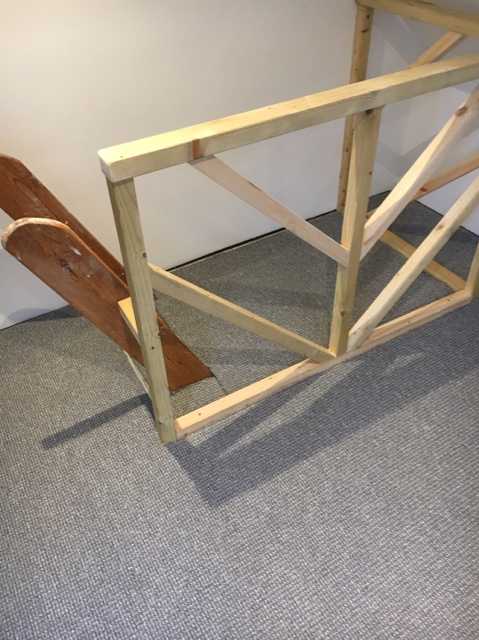 However if I put in some knee boards and some sort of ceiling joist along the apex of the roof will maximise the insulation I can install. Any thoughts on acces (currently the hole for the stairs is just....open) would the best option be a partition across with a door, or there other options I'm missing? So a bit of an update, project coming along, first up was the addition of an extra window, made it a lot lighter. I've installed some knee walls, 700mm high (wishing I'd made them 600mm for ease of fitting the plasterboard!) 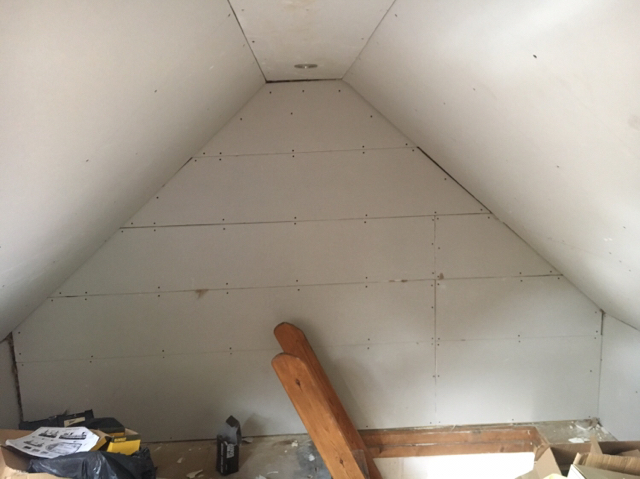 then used 75mm celotex along the rafters, the 'ceiling' and knee boards (not in the photo) and 50mm of fibre on the ends, all with a decent layer of vapour barrier over the top and then plasterboard. Also extended the ring main for an extra couple of sockets, and some downlights (ceiling is only 205cm high). Biggest learning curve has been the plasterboard, fitting properly (a few things I'd do differently next time) with a few gaps bigger than I'd really want (this is literally the first time I've done any sort of project like this), one of the most difficult parts of trying to fit the plasterboard sheets to the sloping ceiling! Need to finish off, round the windows, then the joints which I'm really dreading! Just as well it's not under the Building Inspector: the rafters either side of the Velux windows should have been doubled up and also the trimmers, (and the BI would have wanted Jiffy hangers on the trimmer joints). I'd have put a top plate on the *knee* (Ashlar) wall. Cheers for the points, I got a roofer to fit the second velux, seemed to think it would be ok with the load. Some of the building regs do appear a tick box exercise :) the trimmers are only 40cm long and not structural. Think the top plate on the Ashlar would have made the plasterboard fitting a bit easier though! Just a small point for someone that was in a house when it burnt down, if there is a fire in the garage, your intended escape route from the attic will take you down and across the lower window, they are the first to go and all the heat and flames will go upwards to singe your buttocks as you come down, just make sure you have fire alarms and extinguishers, and learn how to use them. Thanks Nos, already got the smoke detectors (good idea for the extinguisher), it's a only first floor so the velux is the second route out (the new one does meet the fire regs in terms of height and size) . Did think about one of those emergency 'rope ladders' to help egress in worst case . So update is that I've now finished! Pretty happy with it overall, considering I've never done most of the work before, plastering was good fun! Also finally sorted the other end out with the hatch. Neatest solution I could come up with unless I was to over complicate things!